Armenia, a small country that is relatively poor compared with the rest of Europe, has welcomed the influx of refugees crossing its borders, giving help to those who need it, writes Eduardo Lorenzo Ochoa. Eduardo Lorenzo Ochoa is director of European Friends of Armenia. Since the beginning of the Syrian civil war, 17,000 Syrians have come to Armenia. 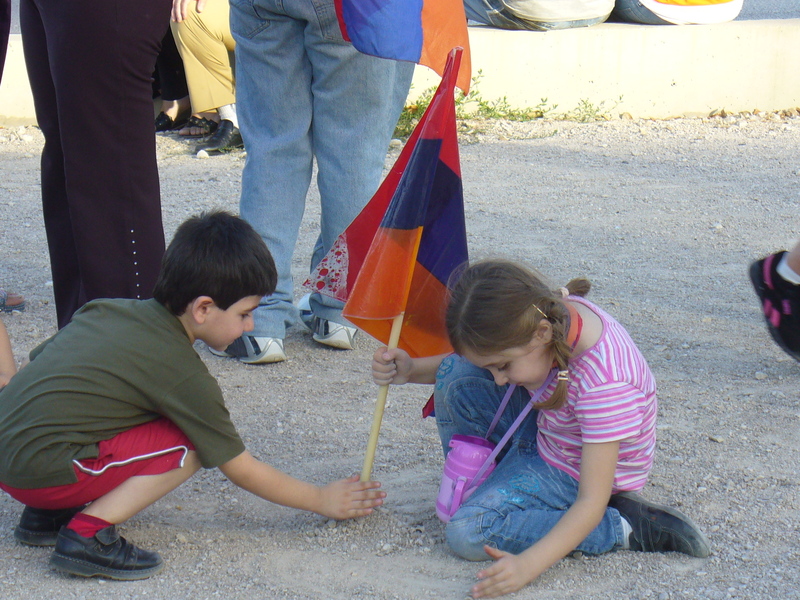 Though many of them are of Armenian descent, other persecuted communities, such as the Yazidis and the Assyrians, have also been able to make Armenia their home, albeit temporarily. Armenia has the third most war refugees from Syria in Europe. With a GDP ten times lower than the EU average, and roughly 3 million inhabitants, the current refugee crisis has demanded many efforts from the South Caucasus republic. Unlike Lebanon, Turkey or Jordan, Armenia has not received any substantial financial assistance from the EU. Nevertheless, the Armenian Ministry of Diaspora publicly insisted that “if refugees decide to come to Armenia, our state must do its best by means of joint efforts with international structures and different Armenian organisations to receive them”. From an administrative point of view, those reaching the Armenian borders, depending on their situation and background, can apply for citizenship, residence permit, or else request an accelerated asylum procedure. Having no prescribed “welcome centres” as such, Armenia has launched several initiatives to help newcomers feel at home together with the UN and civil society. The ‘adopt-a-family’ project matches them with Armenian host families who provide emotional and psychological support. To overcome cultural and linguistic barriers free education and language classes are also offered. Legal advice was also given to over 6,000 newcomers as of 2014. Subsidy schemes were made available for rent, food and healthcare. Despite the 17% unemployment rate, most locals see this exodus as an opportunity for their country. Migrants bring new skills to the Armenian economy and also a different business culture. They are good entrepreneurs and very quickly re-open their businesses. So far, 245 businesses have been opened by migrants who have arrived from Syria. The massacres perpetrated by ISIS in Syria and Iraq have reminded Armenians of their own history. Many Syrians who came to Armenia are actually descendants of survivors of the Armenian Genocide and numerous Armenians feel a moral obligation to provide them with a safe haven. This also explains why the Yazidis, who are facing extermination in their ancestral lands, are welcomed with open arms. Back in Brussels, the refugee crisis has put the notion of ‘united in diversity’ under pressure. EU members states are showing anything but unity as some are appealing to the Court of Justice to overturn a decision made on how war refugees should be spread. As for ‘diversity’, we can all draw our own conclusions. In theory, the member states agree on the defence and promotion of European principles and values, but unfortunately they differ widely in their understanding of what should be put into practice. This has been evident throughout the current war refugee crisis. The level of solidarity shown by Germany and Sweden diverges drastically with the approach of some other countries. On a more positive note, this humanitarian crisis has also shown that there is a European community of values which stretches from the South Caucasus to the Atlantic. This community is not defined by membership to a particular customs union, but by common principles which countries and their people hold dear. Throughout the refugee crisis, Armenia is quietly reminding the world what European values really are. History shows that Europe has been at its best when it has provided shelter for those seeking safety from persecution and destruction. The Armenian approach to the current crisis is a direct continuation of this praiseworthy tradition, and proves that Armenia is fully and undeniably part of the European community of values. The tragic events in Paris are a direct attack on these very same European values. This explains why Armenians were quick to gather all across the country to mourn the victims and express solidarity with the people of France. Among them was also Armenian President Serzh Sargsyan, who took part in a candlelight vigil held at the Embassy of France in Yerevan. For various reasons, it remains highly unlikely that Armenia will participate actively in any military operation taking place in Syria. Russia and France have already started intensifying their air raids on ISIS targets, which will increase the flow of refugees at least in the mid and short term. Just as it has done in the past, Armenia will continue to be a safe haven for those fleeing war and persecution. Charles Aznavour, whose own parents fled to Europe after the Armenian Genocide, said he ‘will always take the side of those who knock on doors, not the ones who shut them.’ I believe that these words reflect the feeling shared by countless Armenians and other Europeans when they are confronted with images of people fleeing war in an attempt to save their lives. These are the European values which unite us, from the cliffs of Ireland all the way to the mountains of Armenia.